Growing up I was involved in a variety of sports, competing in sailing, surfing, swimming, football, basketball, and soccer, while also enjoying mountain bike riding, snowboarding, and skateboarding. In high school, I lettered 3 years on the football team, playing at a outside linebacker/strong safety hybrid position called monster. Our team won the CIF Div. IV Championships with a 13-0 record in 2009. I also lettered one year on the swim team, played basketball for a season, and was on the surf team, competing in Interscholastic contests as well as other Pro/Am contests. I also raced sailboats, representing Mission Bay Yacht Club. Sailing at this time in my life kind of took a back seat to my love and commitment to other sports, but recently has become my main. I was introduced to sailing at a young age. My parents would take me out on boats and when I was 7 I enrolled in the Junior Sailing Program at Mission Bay Yacht Club in San Diego, CA. I started out learning in sabots. I starting racing in these boats, and as I got older I progressed to 420s, lasers, and bigger boats. I have won multiple local regattas in these boats and done well in national regattas as well. Some notable achievements were winning the 2007 Mark Reynolds Perpetual Trophy in the 420 class, and placing third ans then second in the 2008 , 2009 ISAF Youth World Qualifiers in Multihulls. After graduating from Mission Bay High School in 2011 second in my class and Male Athlete of the Year, I went to UC Santa Barbara to pursue a degree in physics. I planned to compete at this University on the surf team, which is one of the top ranked teams nationally, and also was considering trying out for the triathlon team . Unfortunately, a couple weeks into my freshmen school year I suffered a spinal cord injury; I was 18 years old. I broke my neck in a freak accident in which I slipped on a boat dock and clipped my head on the end of the dock. I was partially paralyzed from the neck down. The rehabilitation process has been a long one, but I have slowly recovered movement in my legs, to the point I can now walk short distances with a walker, and have almost full upper body strength. Along with rehabilitation, I was taking classes at MiraCosta Community College but as of October 2014 I have transferred back to UCSB. I am a full time student and in my spare time I am active in the Triathlon Club, working out, surfing and sailing. Though this injury has been a life changing experience, I approach it with optimism. Being the athletic person I was before, I also knew I had to get back out there and renew my passion for sports. Sailing has been a perfect fit. I started sailing again through Challenged America, run out of San Diego by a group of great volunteers. From there I have progressed back into the competitive side of sailing, racing in the 2013 Clagett Regatta, which served as the 2013 US Sailing Team Sperry (USSTS) team qualifier, where I took first place. 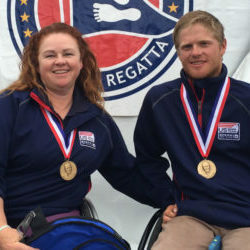 Making the USSTS team solidified my aspirations to compete at the Paralympic Games. The goal now is to represent the United States and medal at the 2016 Paralympic Games in Rio. Maureen brings unique experiences to the position. 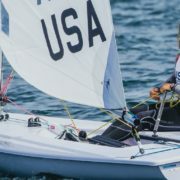 The pinnacle of her sailing career was having the honor of winning the first Gold medal for her country in Paralympic Sailing with her teammate, Nick Scandone at the 2008 Beijing Paralympic Games in the Skud 18 class. Maureen began sailing as an adult at a public sailing center. Her passion for competitive sailing was ignited only after disability and motherhood, thanks to a mentor in the Sonar class. 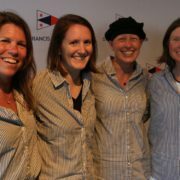 2008 US Paralympic Team, two-person SKUD sailing team, first woman qualified. Eight-time member & first female of the US Disabled Sailing Teams, 2002-04, 2006-09, 2015. Sonar & SKUD 18.